Move your aircraft on an approach, to a runway takeoff point, on a helipad, a gate or parking position or any other custom geographical location you choose. There are two options to select an airport. Just enter the ICAO code of the airport in the corresponding field and the airport will load immediately. Alternatively you can also use the button Random to choose a random airport. Click on this button to open the Select Airport dialog. Here you can see the name, country as well as city of the currently selected airport. Now you can choose on which runway or helipad you want your aircraft to be place. Note: This selection can also be directly accessed by the keyboard shortcut N.
After selecting a runway some additional information about this runway is displayed. For helipads this information is not displayed before you choose a specific helipad in the next step. Note: This option is only available if you chose a runway. 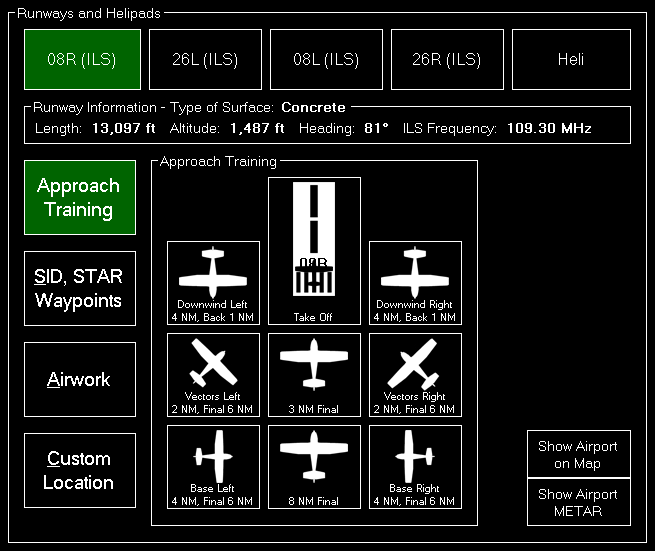 To start an approach training just click on one of the button to place your aircraft it the corresponding position. If the runway is ILS enabled the correct altitude above ground will be calculated using the runway-specific glideslope degree. Otherwise the default of 3° will be used. 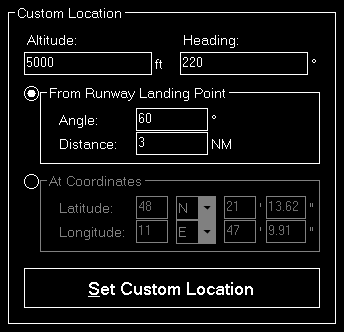 All parameters like distance to landing point for the two final positions, distance for the base positions or altitude above ground for the downwind positions can be configured in the Settings module. Note: This option is only available if you chose Heli. 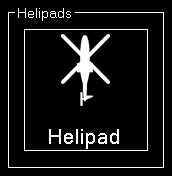 Click on one of the helipad buttons to place the aircraft on a helipad. 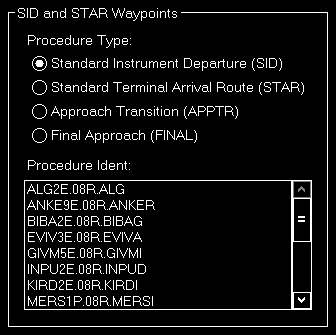 You can place your aircraft directly on a waypoint of a Standard Instrument Departure (SID) or Standard Terminal Arrival Route (STAR). First select which the desired procedure type - SID oder STAR - and then the procedure ident. 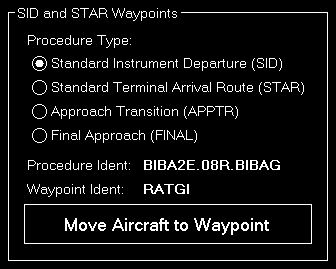 Finally you can select one waypoint of the procedure you have chosen. Now click on the button Move Aircraft to Waypoint to change the aircraft position accordingly. Note: The aircraft will be automatically set in a way that the heading matches the direction to the next waypoint in the procedure. 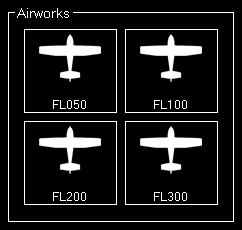 Choose one of four pre-defined flight levels to start your airworks. Of course, also these altitudes can be easily changed in the Settings module. If you want your aircraft to be place at a completely custom location, this is the right section for you. First enter the desired altitude (above MSL) and heading of the aircraft. Then you can choose from two options to define the position. Using this option the aircraft will be move a definable distance away from the runway landing point in the entered direction. Or you can just enter the exact geographic coordinates manually where you want the aircraft to be place. The fields are pre-filled with the coordinates of the currently loaded airport. Use the button Show Airport on Map to switch to the Map module and center the map on the current airport and the button Show Airport METAR to show the current real-time weather information for this airport. 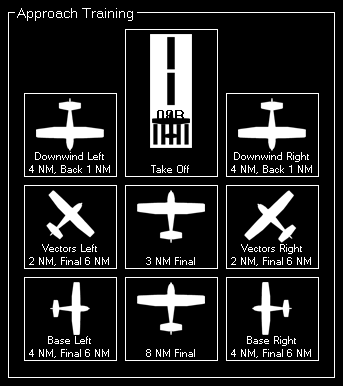 You can also place your aircraft on a gate or parking position. Therefore first select the type and then a specific gate or parking. 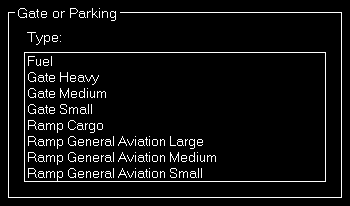 And then click on the button Move Aircraft to Gate or Parking to finally place the aircraft. Here you can find several options like speed and gear/flaps status that are used when placing the aircraft. All options are saved upon change and can even be defined on a per-aircraft level when aircraft profiles are enabled in the Settings module. Note: When aircraft is placed on ground gear is always extended and ILS frequency can only be set obviously if the runway is ILS enabled. Here you can save the current flight situation including aircraft position, altitude, speed, heading as well as pitch and bank angle. If there are more than 6 presets, you can page through them using the buttons Back and Next. 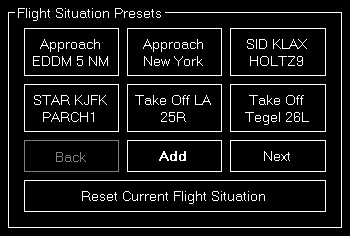 After clicking on the button Add to create a new situation preset or click on an existent one to send it to the flight simulator. To reset the simulator you can use the button Reset Current Flight Situation. Note: For X-Plane this is only available starting from X-Plane version 11.10. 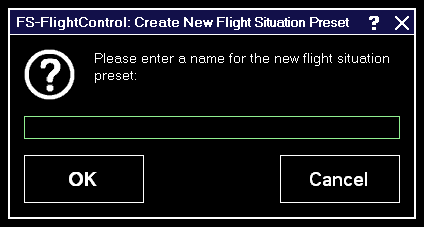 When creating a new flight situation preset, you need to enter a name for it in this dialog. If you right click (long “touch”) on a flight situation preset this pop-up menu will be shown enabling you to rename or delete an existent flight situation preset again. 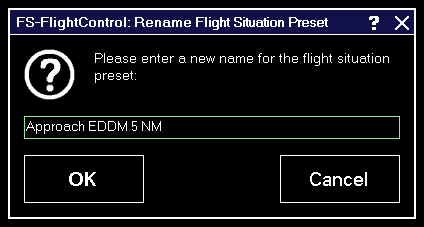 Here you can set a new name for an existent flight situation preset.